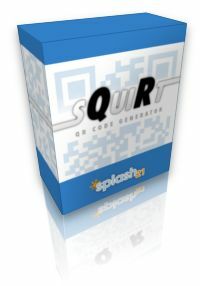 The sQuiRt library for LiveCode generates QR codes according to the ISO international standard (ISO/IEC18004). 'QR Code' is a registered trademark of DENSO WAVE INCORPORATED. (L, M, Q, H) are supported. Correction levels and approximate error correction capabilities. As this library is 100% LiveCode, it is suitable for Mac, Windows, Linux, Mobile and LiveCode server platforms. set the mainStack of stack "sQuiRt" to "MyStack"
Now save your stack and sQuiRt will be saved as a substack. The following commands show an example of using the library. -- LC color references also work : "0,0,255" instead of "Blue"
"MyImage" - the name of an image object on the card, a filename or the special code "!" which will return the image data in the result. "QR data" - the data to be encoded. "M" - error correction level (L, M, Q or H). "3" - module size: you can make the code larger/smaller. You can also just rescale the image after the code has been created. On failure, the result will contain "Error:" and then an error description. If the special character '!' is used for 'MyImage', then the result also contains the raw output of a png image. You can use this data, for example, with LiveCode server to generate QR codes on web pages.